Netflix Brings David Letterman Back To The Interview Chair — With A Few Twists The former late night host returns to what he does best — interesting, unpredictable talk — in his new series, My Next Guest Needs No Introduction. 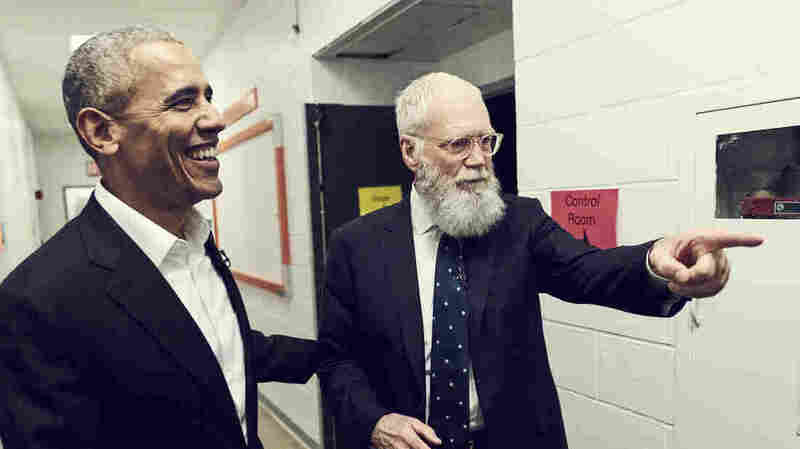 David Letterman interviews former President Barack Obama on My Next Guest Needs No Introduction with David Letterman. Netflix usually presents its new shows one season at a time, with a dozen or so episodes available immediately, but its latest talk show is being unveiled at the unusual rate of one installment per month. It's called My Next Guest Needs No Introduction with David Letterman — and it's excellent. The program marks Letterman's return to the talk-show format and to series television, a journey he began in 1980 with his brief but brilliant daytime talk show, NBC's The David Letterman Show. After that, he clocked 11 years on NBC's Late Night with David Letterman, from 1982 to 1993, then went straight to CBS' Late Show with David Letterman, where he lasted another 22 years. One of his final guests on CBS, before retiring in May 2015, was then-President Barack Obama, who was a year away from wrapping up a long-running job of his own. Letterman's new Netflix show opens with a clip of that final interview — which seems appropriate since Obama is the first guest on Letterman's new show. For Letterman, the new show isn't merely a comeback; it's a reboot. His previous talk shows — all of them — were irreverent deconstructions of the genre. But they relied on the same basic format and trappings introduced by the Tonight Show hosts who invented and honed the form: Steve Allen, Jack Paar and Johnny Carson. Carson was 66 when he retired; Letterman is now 70 — but the old dog has some new tricks. This is his first series not made for broadcast television, so there is no censorship of language. There is no topical opening monologue, because on Netflix these shows are meant to be watched whenever the viewer wants to see them. There is also no band, no flashy set and, because Netflix is a paid streaming site, no commercials or interruptions. There is, however, a studio audience — the premiere was taped last fall at the City College of New York, in an auditorium filled with mostly young people who had no clue who Letterman's guests would be. This is a talk show stripped to its basics: one main guest for the hour, with the two of them sitting in plush leather chairs on an otherwise bare stage. Letterman retains his long, bushy white retirement beard — he calls it his "aging vagrant look" — but his questioning skills, and his listening skills, are as sharp as ever. Paul Shaffer, the bandleader on Letterman's previous series, provides the theme music, but he's not on stage or on hand. The show's director, Michael Bonfiglio, has his cameras capture the action by constantly prowling. They glide slowly but add movement to an otherwise aggressively stark and static presentation. Each show makes room for a brief, pre-taped, on-location piece, where Letterman visits and interviews someone with an association to the main guest. But the vast bulk of My Next Guest Needs No Introduction is just two people talking — and not about a new project the guest wants to promote. Just interesting, unpredictable talk. Much of the conversation with Obama was personal, and the two men mostly stayed away from politics and news. The premiere show also features another politician: Rep. John Lewis, D-Ga. Lewis is shown in an on-location piece chatting with Letterman about race, politics and history as the two walk across the Edmund Pettus Bridge in Selma, Ala., where Lewis led a march protesting segregation more than 50 years earlier. So don't expect a top 10 list or a "monkey cam"; Letterman is here to talk and listen — and that's about it. For me, that is more than enough. There are countless talk shows on TV, but almost none provide the depth and length of conversation Letterman's new show provides. He and Netflix have scheduled six monthly installments of My Guest Needs No Introduction. If they don't keep making more, I'll be stunned. I'll also be very disappointed — because TV needs the curiosity and irreverence of David Letterman now more than ever.